Snapdragons and teapots: Gung Hei Fat Choi! Or... Happy (Chinese) New Year for non-Mandarin speakers. Overall, the Year of the Ox is expected to be as slow-moving and steady-as-you-go as an ox dragging a pile of bricks on its back through a muddy rice paddy (you get what I mean). This is a conservative year, full of traditions and values (I know like, a thousand people getting married, so that makes sense). However this is not a year to be outrageous (goodbye Amex). 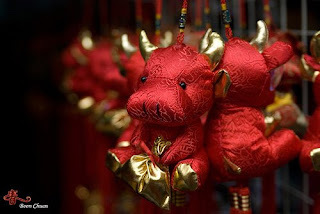 The year of the Ox will bring stability and growth in the face of patience and diligence. It is also a year of harvest, where we reap what we have sown (uh oh... I hope there's no cosmic bad karma hanging around!). So people... In all my mystic wisdom. Work hard, be patient (I've already broken this rule and been punished for it several times over) and don't under any circumstances be crazy outrageous. Is anyone else feeling stifled?